This stove has a higher stand with open mouth for adding wood more conveniently. there is no need for fuel canisters with no chemical emissions, no batteries meaning a small carbon footprint. Fuel can be added by collecting twigs and sticks from the environment, say goodbye to heavy, costly, polluting petrol fuels ideal for stealth camping. 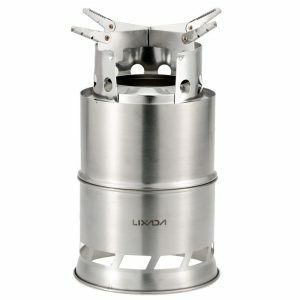 A very tough stove made of hardened stainless steel, the stove is meant for rugged backpacking, camping and is housed in a mesh bag for convenient carrying.